We have a lot of great stuff planned over the next six days. Josh is doing a lore update tomorrow along with some other BIG announcements, we are organizing an AMA over on reddit so everyone can ask Tim, Josh, Feargus and myself (Adam) a ton of questions, and we are getting our crazy ideas put together for the live stream of the last hours of the campaign next Tuesday. Along with this update, we wanted to get some housekeeping out of the way. First off, we get asked a lot about what is in each of our reward tiers. You can find the full list farther down in this update. We are going to keep this list constantly updated, so if you ever need to refer to it, just come back to this update. We are also working on our main Kickstarter page to keep things organized and have a new stretch goal image that combines all the stretch goals that have been added. The Chanter and Paladin classes are up next at $2.7M, and the talented George Ziets will be joining the team if we hit $2.8m! With each stretch goal hit not only are we adding a new feature, we are also making the entire game larger. The additional money raised lets us add designers, artists, animators, and programmers to help build this incredible new world we are creating. This means adding more reactive quests, choice and consequence opportunities, a varied bestiary, memorable characters, adventure areas, and combat abilities. Due to popular demand and for a limited time, we are offering the ability to add our first expansion pack, due out approximately six months after Project Eternity ships. Any money contributed to add-on the expansion now will be used to make the main game larger. The expansion budget is not being created by money from this Kickstarter. We will be sweetening the $165 reward tier with something extra in the upcoming days as well. If you are at the $20 Pledge level or higher, you can add the following items to your reward tier. Check out Update #4 on more information on how to Add-On rewards. For t-shirt add-ons, we will ask for your size at the end of the Kickstarter campaign in a survey sent to you in e-mail. Discuss Update #19 in the Project Eternity Forums. Project Eternity Kickstarter Backer Forum Badge. Digital Downloadable Copy of Project Eternity, DRM free for Windows, Mac, or Linux. Digital Downloadable Soundtrack in MP3 and FLAC. Digital Novella by Chris Avellone. Digital High-Res Concept Art Pieces. Box Version of Project Eternity, DRM free for Windows, Mac, or Linux, with DVD and printed manual. 2nd Digital Downloadable Copy of Project Eternity, DRM free for Windows, Mac, or Linux. Thank you postcard from the development team. Collector's Box Version of Project Eternity, DRM free for Windows, Mac, or Linux, with DVD and printed manual. Cloth Map of the World. 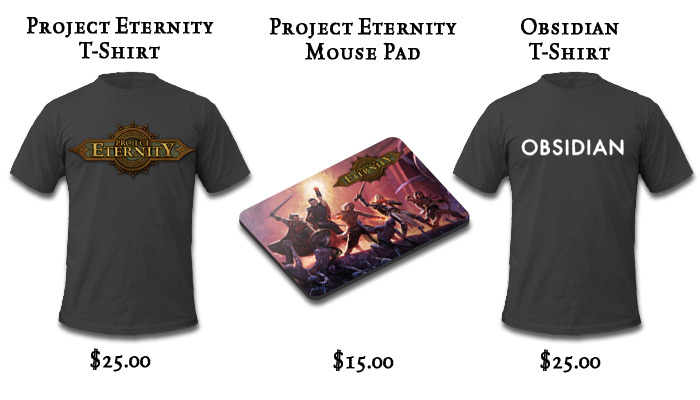 Project Eternity Kickstarter Backer Cloth Patch. Digital Downloadable copy of Wasteland 2 DRM Free. Digital Audio Book of the Novella by Chris Avellone narrated by a professional voice actor. Digital Novella by Chris Avellone . Collector's Box Version signed by Chris Avellone, Tim Cain, Josh Sawyer, and the rest of the Project Eternity team. The game copy is DRM free for Windows, Mac, or Linux, with DVD and printed manual. Full Color Printed Hardcover Project Eternity Collector's Book. Elite Version of the Project Eternity Kickstarter Backer Cloth Patch. Your name and a personalized message on a memorial stone in-game. Full Color Printed Hardcover Project Eternity Collector's Book signed by the development team. Gold Pledge VIP Forum Badge. Gold Pledge Special Thanks in-game credits. Name and Design an NPC in-game. 5 Extra Digital Downloadable Copies of Project Eternity, DRM free for Windows, Mac, or Linux. Help Design an Epic High Level Weapon, Armor, or Artifact. Custom portrait painted by an Obsidian artist to be included in Project Eternity. Art print of your portrait signed by the artist. Name and design an enemy adventuring company. 15 Extra Digital Downloadable Copies of Project Eternity, DRM free for Windows, Mac, or Linux. Watcher Pledge VIP Forum Badge. Invite to the Project Eternity Launch Party. Play a game with Tim Cain, Chris Avellone, Josh Sawyer, and Feargus Urquhart. 10 Extra Digital Downloadable Copies of Project Eternity, DRM free for Windows, Mac, or Linux. Just added $20 to my pledge. Now rubbing hands eagerly in anticipation of my boxed CE and the digital EXP. Is there going to be a level editor/toolset for this game? I would love to be able to build my modules similar to neverwinter nights 2. No, you're still probably going to end up paying customs fees for an overseas package, but that's not Obsidian's fault. Also, as a company, they have to declare the contents of the package accurately. To do otherwise would be mail fraud, and the powers that be are Not Amused by such things when they find out. Of course, now I have a mental image of Josh, Feargus and crew knee-deep in boxes and goodies in the last, feverish weeks before launch. "No, no. We are TOTALLY private individuals sending out gifts to our...er...thousand or so friends all over the world. Nothing suspicious here. Move along!" no, obsidian has said in the comments that they're going to fund it themselves. comes from feargus. Oh, and is there any chance of actually having the soundtrack / various other 'digital' goodies on a disc / flash drive (or even a PE-themed Mimobot-like flash drive)? I'm on the fence between $250 and $500 - there just doesn't seem to be that much of an incentive to make the jump, to be honest. "Your name and a personalized message on a memorial stone in-game. Gold Pledge Special Thanks in-game credits." Apart from that - everything you guys are doing so far sounds *exactly* like the kind of game I loved and still love to play. The early backers get the game for $20. The rest of the backers get the game for $25. Then, after release, customers can get the game for $30+ (Obsidian has said all the backers are getting a discount). Obsidian will then release a full expansion, not DLC, 6 months later for only $20, the usual price for an expansion. I see no issues with the price here. A physical strategy guide for an add and a collectors guide with all the names in the back please as add on.. I'm with Andrew on this one. Unless the expansion will be so massive that it basically amounts to a sequel, there's no reason for the price to be this high relative to the original. Since I'm on the early bird tier myself, it's the exact same price as the full game. This is especially problematic since we know absolutely nothing about the expansion. We only have very limited knowledge about the game itself at this stage, and Obsidian have barely begun making it. So how can we be expected to shell out twenty bucks for the add-on? Thank you Obsidian for listening! I am very pleased that you added the Expansion Pack option as an add-on, since so many of us requested it. I, for one, see the $20 price as very reasonable. Looking at other games, such as Spellforce and Spellforce 2, their expansions were almost as expensive as the original game when they first came out. Anyone is more than welcome to not opt for the expansion and wait for a bargain price later on down the road. You do have to run a business after all. A copy of the game costs a $25 pledge - $20 if you got the early bird. And yet, the add-on for the expansion pack is $20?! The math there seems a bit off. Should have been $5-10. Guess I'll just wait for release and/or sale. @Philomorph I realize it's not a store. When you buy something from a store, even a very long preorder, you are guaranteed to get it (or get your money back). On kickstarter you are not. Even though this project long ago met its funding goal something catastrophic could still happen and backers could end up with absolutely nothing. In return for that risk we backers typically get as you say "some sweet rewards" which is why I expect what I get from kickstarter to be better than what someone who does not take the risk and just waits for the game gets. I'm happy with my pledge itself and I'll likely get the expansion eventually but I just don't feel $20 for an expansion is such a "sweet reward" and I voiced my opinion to that effect. You are of course free to disagree but I believe the expression of our opinions is the point of having these comments. Did they say approximately when the Beta would be released? +$25 is a lot if the Beta only comes out a few weeks before release, but would be interesting if it's coming out in 2013. Philomorph - let's face it. This might be a case with small companies, but if something in a size of Obsidian wants to create a game and runs it through a kickstarter: IT'S NOTHING ELSE THEN A PREORDER with extremely long wait period. Boy you just can't please some people. Nick, KICKSTARTER IS NOT A STORE. It's a way to support creative developers and get some sweet rewards while doing it. If you are happy to pay $25 to support this project and get a free copy of the game later, then great. If you aren't interested in kicking in another $20 to support them more (and get another great bonus) that's cool too. So the whole game costs $25 (or $20 each if you get 3) which I assume is a Kickstarter deal and it will be more expensive upon release. The expansion costs basically the same as the whole game and if that's likewise a kickstarter deal it will cost even more on release?!? Maybe it's just me but while the game itself feels like a steel and I'm happy to back it the expansion doesn't seem like a deal at all. Hopefully the main game has enough content that I'll just wait for a sale on the expansion to pick it up for less than this. Added on $20 for the expansion. It's been a long loooong time since I've been this excited about a game. Great update. I was hoping for an expansion add-on to any tier. I'm a little disappointed if those are the final designs of the Tshirts. I was really hoping for the simple Jormungandr (snake biting its tail) design. I'll definitely still be wearing it but I really want to find a Jormungandr shirt now! At the 165 USD digital tier, does that mean I get 2 copies of the core game and 1 copy of the upcoming expansion? Nice new add-ons, especially the expansion pack. What happened to 2x digital downloads for the $250 tier? That was a fairly strong motivator for me - the idea being I'd get some nice gifts for friends to enjoy it who otherwise wouldn't. Nice update guys - makes everything much clearer. Back up to $100 for me and no physical goodies to have to buy , package and ship. Best of luck for the end of the kickstarter. Expansion as an add-on? I'm there! 20 more bucks from me, making this the first time I have spent more than $60 dollars on a game. I Have to say I like the ouroboros desing better. But maybe a dual sided print ouroboros in front and logon on back ? Im geussing that add-on is going to give quite a boost to the total amount these last few days. Wow great update! I'm looking to bump up my pledge even more for the expansion. This is an amazing journey for me to see fellow supporters give so much love to this project. @Grasher. Steam and GoG versions are alreasy implemented. Please add steam version. It's very comfortably to have all games in one place. + autoupdates and other steam services. I know, that steam takes part from your income, but the service it provides worth it. You can use Greenlight very easily, I think. What a great and useful update! Well this update is quite...insubstantial..especially for one in the last week of the kickstarter.. Anyway, I just wanted to say I hope the t-shirt designs will change later and you'll give us backers a cool and unique looking shirt instead of a boring generic logo shirt. Aside from that I'm still crazy excited! Will we be getting regular updates after the Kickstarter backing period ends? I hope we arent kept in the dark until the game is released in 2014. Thanks for listening to the community!! I have added $20 for the expansion and can't wait for my collector's edition! You just need to add the amount. Just don't change your reward tier. There will be a survey when the project ends to ask you how do you want to spend the surplus money. Cool. Any chance you will be listing Paypal tallies? I'd love an add-on of the Cloth Map / Patch as well! Please! I'm lost for words ! Thanks again ! Any chance of adding the cloth map as a physical add-on? I would pay extra for that, definitely. + $20 for the expansion! Thanks!